Anita Dobson is the latest high-profile performer to take on the coveted role of Miss Hannigan in Annie, the oft-touring Broadway musical that’s once again hitting the road this month. Anita is playing the character until the end of April, at which point Craig Revel Horwood will step back into a role that he first performed in 2015. A heart-warming rags-to-riches story of a little girl who finds herself transported from a New York orphanage to the luxurious world of millionaire Oliver Warbucks, the show features plenty of memorable songs, including It's A Hard Knock Life, I Don’t Need Anything But You, Easy Street and, of course, the legendary Tomorrow. 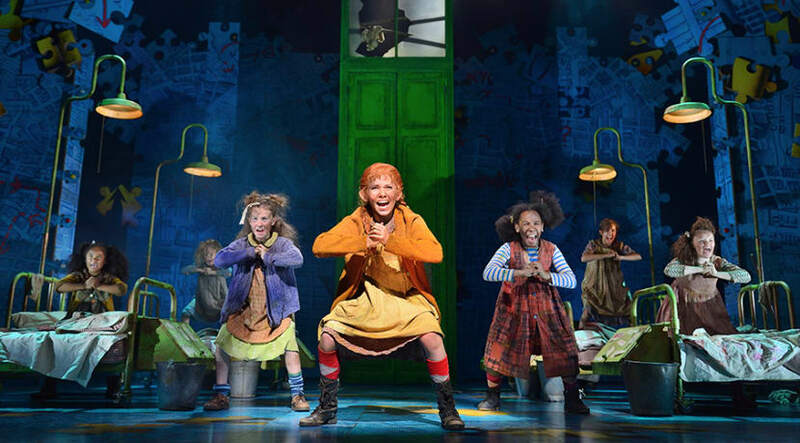 It’s the hard knock life, especially for the children of Miss Hannigan’s orphanage. Toughened up by life in the Big Apple, you wouldn’t pick a fight with this gang of girls! Cheeky and charming, they’re brilliant in every scene. Leader of the ragtag bunch is Annie (Ava Smith for this show), bursting with attitude, hopefulness and wit. Classic number It’s The Hard Knock Life is perfectly delivered. Working the youngsters to the bone is the larger-than-life Miss Hannigan (Anita Dobson), hilariously falling apart as a result of ‘looking after’ them (and maybe due to the odd tipple as well!). Hannigan’s scheming brother, Rooster (Richard Meek), and his partner, Lily (Jenny Gayner), are both brilliantly sleazy. The scheming gang close in on a plan to take Annie - but will they succeed? As Annie pieces together her life, symbolised by the clever puzzle-themed set design, she bumps into audience favourite Sandy the dog (Amber). Along the way she meets the hard-done-by people of the city, played by the dazzling Ensemble, who also appear as a range of colourful characters in show-stopping numbers such as NYC and A New Deal For Christmas. Saving Annie from a life of misery are the endearing Grace Farrell (Carolyn Maitland) and the charming Daddy Warbucks (Alex Bourne), a lovable Lex Luthor lookalike with all the money in the world but nobody to love. Annie brings true joy into his life, and the pair are wonderfully inseparable from thereon in. Annie is more relevant than ever in these challenging and uncertain times. At its heart it’s a show about love, unity and hope in times of struggle. Presented with a welcome slice of old-school Broadway razzmatazz, it transports its audience to the NYC of their dreams. Catch it while you can at the Wolverhampton Grand. It runs until Saturday 23 February.